Big Sandy Area Community Action Program (BSACAP) has the privilege of announcing the retirement of Executive Director James Michael Howell. 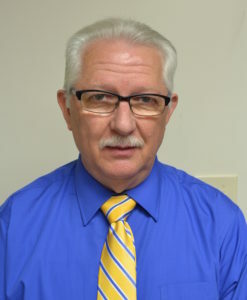 Howell has served the Big Sandy region for over 40 years and has served as Executive Director of the nonprofit organization for the last 22 years. 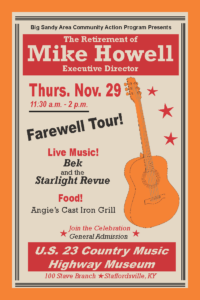 A celebration in honor of his achievement will be held on Thursday, November 29 from 11:30 a.m. – 2 p.m. at the U.S. 23 Country Music Highway Museum, located at 100 Stave Branch in Staffordsville. Colleagues from the public and social service sectors along with former employees are welcome to attend. Big Sandy Area Community Action Program is a nonprofit organization dedicated to providing a vast array of services, such as employment and training assistance, weatherization of homes, and area Head Start programs, in order to assist individuals and families in obtaining self-sufficiency. Through collaborative efforts of community and organizational partnerships, BSACAP seeks to improve the overall quality of life within the Floyd, Johnson, Martin, Magoffin, and Pike County communities.